If you are a woman, hold tight – I am going to upset you…! And if you are a man, sit back, relax and say “I told you so”. Here goes – women cannot multi-task. Research is quite conclusive on this; sorry…! When people do more than one thing at a time their effectiveness and efficiency on each of the separate tasks falls. In other words if you try to do more than one thing at a time you perform worse on both of those things. 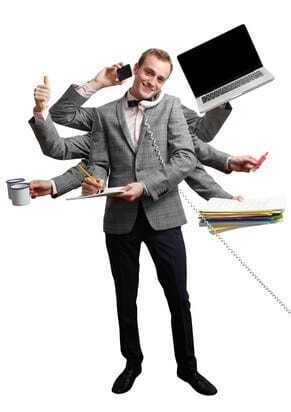 Women think they can multitask, largely because they have to juggle more things than men have traditionally had to do. But thinking you can do something and actually being able to do it are entirely different things. After all, there are several candidates on X-Factor who are convinced they can sing…! These days, though, we are being encouraged to multitask. We are watching TV and Tweeting about it at the same time. We are at an event and using our iPads to follow live blogs about the subject. Or we are reading an article in a newspaper and checking out relevant websites at the same time. The phenomenon of “dual screening” is established nowadays, with people having a laptop or tablet with them as they watch TV. A new study by Microsoft has identified several different ways in which we multitask. The most common they call “content grazing” where we do a bit of TV watching and a bit of Facebooking all at the same time, for instance. The advice Microsoft provides as a result of their research merely encourages content providers to “help” all those people who are multitasking. And therein lies the problem. Businesses who take up the suggestions will be helping us to do more multitasking as a result – and that will simply lead to higher levels of reduced performance. Indeed, I suspect that if we did some kind of clever study we’d find a link between the economic ills of the country and the rapid rise in multitasking in offices and business premises throughout the land. Performance and productivity rises when people do one thing at a time, uninterrupted by phone calls or emails, or checking information on another screen or mobile device. Of course, Microsoft is really trying to get you to use their tools, such as Bing, as a means of reaching people who dual screen or content graze. And they do have a point – if people are doing things which mean they are not fully concentrating on your content at any moment in time, then you need to somehow get them to pay more attention to you. We don’t live in the ideal world where people do one thing at a time – even though from a performance point of view that is by far the best solution. So, your business does need to react to the growing trend for multitasking. And that simply means you have to make your content the most engaging, interesting and exciting stuff around to drag people away from the other content they are viewing at the same time. Otherwise we are entering a world of increased content confusion – and that is going to be bad for everyone’s business.